At the beginning of January 1944 the 'Paladino' was officially recognised not only by the Ministry of Defence but also by the Government. 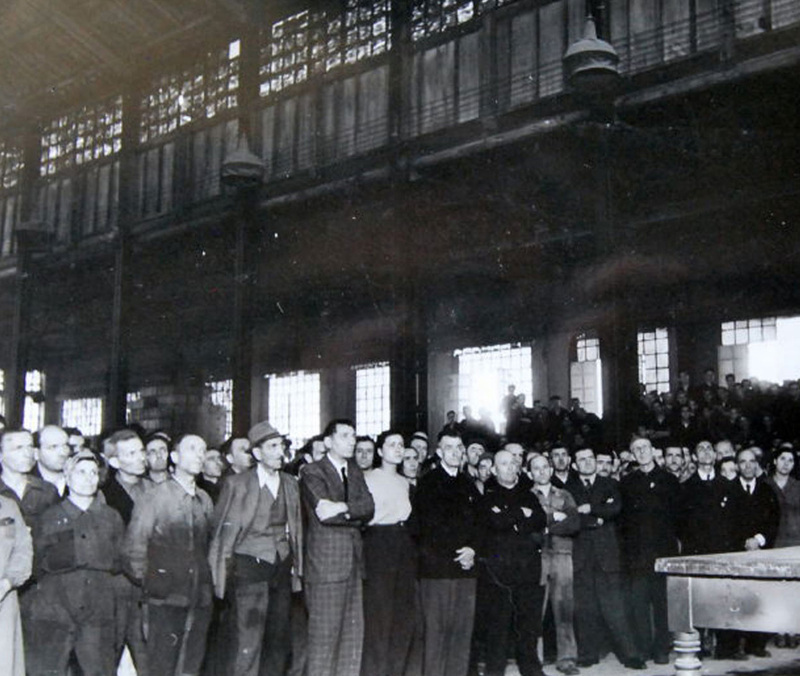 In practice, with this decree Paladino became the sole person responsible for organising recruitment and for deciding the use to which the workers would be put outside the factory environment. 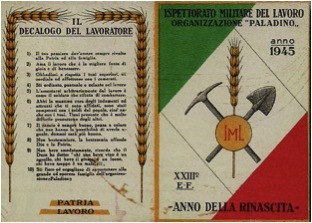 In other words: every type of labour involving the construction of fortifications or the maintenance of military structures, such as roads, trenches, bunkers, barracks and landing strips, was the responsibility of the Paladino Organisation, which also had the task of recruiting workers, allocating them to units, and conducting relations with private firms who supplied materials, mechanical and transport equipment and specialised personnel. In practice, the Paladino was also responsible for finding unskilled labourers to carry out heavy work requiring brute force. This was a tactic typical of the Social Republic, that is, to set up new agencies under a plenipotentiary, with the result that these plenipotentiaries came into conflict both with the traditional bureaucracy and also with differing German plenipotentiaries. Moreover, the Italian agencies had to deal with not only their German counterparts but also with the military commanders of the Wehrmacht who, often at even the lowest levels, took it upon themselves to issue orders or to countermand those Italian orders already given. In that month it had been able to supply a workforce of 29,475 men for a total of 282,000 working days. On 15 February 1944 the RSI passed a new law regarding the obligatory work service and as a consequence both volunteers and conscripts came under the jurisdiction of the Inspectorate. The Paladino was at that point totally under the control of the German Armed Forces, for which it continued to supply manpower throughout the territory of the Republic. On 26 January the territorial organisation underwent a series of transformations: the inter-regional inspectorates were turned into inter-provincial inspectorates whilst the provincial inspectorates were dissolved. The Paladino was therefore made up of inter-provincial inspectorates with offices in Verona for the Triveneto (Veneto, Trentino-Alto-Adige, Friuli Venezia Giulia), Milan (Lombardy), Turin (Piedmont), Genoa (Liguria), Bologna (Emilia), Florence (Tuscany) and Rome (Marche, Umbria, Abruzzo and Lazio). On 31 January 1944 there were seven interregional inspectorates made up of 56 ordinary and 19 reserve battalions. Most of the workers came under Rome (17,406), followed by Florence (5,768), Verona (3,564), Bologna (1,881), Genoa (438), Milan (278), and Turin (140). The number totalled 29,475. The administration was run by its own inspectorate, set up on 16 February 1944. By 29 February 1944 the workforce had increased: there were 1,114 officers, 522 non-commissioned officers and 34,201 labourers of whom 3,983 were based in Verona, 1,042 in Milan, 620 in Turin, 587 in Genoa, 4,713 in Bologna, 5,945 in Florence and 17,312 in Rome. At the end of March the workforce was distributed as follows: 1,201 officers, 683 non-commissioned officers and 42,444 labourers, of whom 3,070 were based in Verona, 1,523 in Milan, 1,235 in Turin, 867 in Genoa, 6, 111 in Bologna, 6,668 in Florence and 22,970 in Rome. Apparently these orders spread panic among the labourers. According to Toussaint, who sent for Paladino to come to his headquarters, a large number of workers had deserted fearing that the transfer was in fact a deportation to Germany, and asked him to create some counter-propaganda to reassure them. Notwithstanding the attempts to contain this desertion, at the end of June the inter -provincial Inspectorate based in Rome was dissolved and with it the thirty battalions based in the provinces in Lazio, Umbria and Tuscany. “Il Giornale d’Italia”, 4 gennaio 1944. Archivio Centrale dello Stato, Segreteria particolare del Capo della Polizia RSI; b.27. Diario Storico della Organizzazione Paladino, pp.7-8. Diario Storico della Organizzazione Paladino, 3 giugno 1944. Lutz Klinkhammer, L’occupazione tedesca in Italia, Bollati Boringhieri, Torino, 1997, p.146. 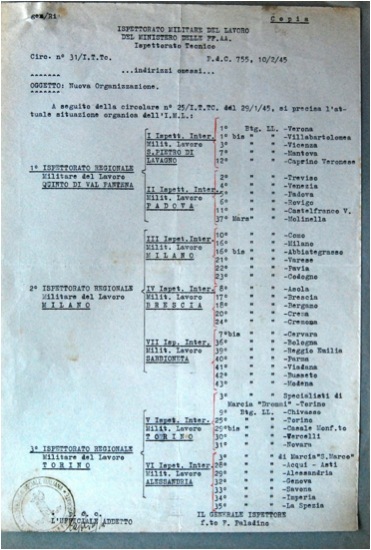 Diario Storico della Organizzazione Paladino, 15 giugno 1944. Archivio dell’Ufficio Storico dello Stato maggiore dell’Esercito, fondo I1, b.44.